There are three different ways to issue and redeem Gift Certificates in XpertMart (tm). In this document we will explain each of these ways of handling Gift Certificates. This will allow you pick the handling that best fits your needs. 1 - Issue Gift Certificates as a Charge on an invoice and redeem Gift Certificates as a tender type. 2 - Issue Gift Certificates as a Charge on an invoice and redeem Gift Certificates as a Credit on an invoice. 3 - Issue Gift Certificates as a tender type and redeem Gift Certificates as a tender type. 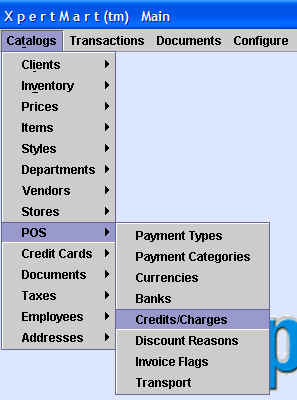 The Credits/Charges field in the Invoicing screen is used to add a charge or credit to the customer's total sale that is not itself an item from your Items Catalog. The Credits/Charges field allows you to use XpertMart™ as a "cash register" and take or give the customer money without subtracting merchandise from your inventory. The Credits/Charges field is very flexible as it lets you enter any amount (unlike the Items detail area where the price is "pulled" from the Items Catalog). Examples of charges you may need to add to a sale are: shipping, alterations and gift wrapping. An example of a credit given to a customer might be a trade-in of an older item. Any credits or charges you enter into the Credits/Charges field will show up in your daily Payments Journal reports but will generally not show up in your sales analysis reports (since they are not regular merchandise that you sell). One of the ways to issue a Gift Certificate in XpertMart™ is through the Credits/Charges field. Issue Gift Certificates as a Charge on an invoice and redeem Gift Certificates as a tender type. First we explain how to issue a Gift Certificate as a charge and then futher down how to redeem a Gift Certificate as a tender type. When a customer buys a gift certificate, select Gift Certificate from the Cr/Ch Type drop-down menu. Enter the amount of the gift certificate in the Credit/Charge field. In the example below the customer is buying a $20 gift certificate. You will notice that the amount entered in the Credit/Charge field is added to the Subtotal yielding a new Total amount. The Credit/Charge will appear on the customer's sales ticket. The Gift Certificate charge can be added to an Invoice that contains items or you can ring it up on its own without any items on the invoice. Note: XpertMart™ itself will not print a Gift Certificate and there is no way for the system to know whether a gift certificate being redeemed is authentic. Therefore, you should have gift certicates printed professionally that are difficult to falsify. The advantage of issuing Gift Certificates as Invoice Charges is that sales are not double counted as merchandise sales. Suppose a cusotmer buys a $50 gift certificate for his wife. A week later the wife buys a $50 garment using the gift certificate. If you follow the steps outlined above, your merchandise journal reports will show that you sold $50 worth of merchandise, not $100. Likewise sales reports run looking at invoice subtotals will not include gift certificates. When a customer is ready to redeem the gift certificate they can use it as a Tender Type. Gift Certificates can be used as the only tender type or in combination with other tender types such as cash and credit card. If the customer is buying an item whose value is less than the gift certificate then you could give them change using cash or as a Store Credit (see the next chapter to learn how). To issue Gift Certificates as a Charge on an invoice follow the steps mentioned above. When a customer presents a gift certificate to apply towards a purchase, select Gift Certificate from the Cr/Ch Type drop-down menu. Enter the amount of the gift certificate as a negative number in the Credit/Charge field. In the example below the customer is applying a $20 gift certificate to the purchase. You will notice that the amount entered in the Credit/Charge field is subtracted from the Subtotal yielding a new Total amount. The Credit/Charge will appear on the customer's sales ticket. When a customer buys a gift certificate you can register it as a Tender Type. You select Gift Certificates from the tender type menu and enter the amount of the Gift Certificate you are selling as a negative amount. Then select the tender type the customer will use to pay for the gift certificate. In the example below you can see that a Gift Certificate was sold with a value of $75 and entered as negative -75. You can combine the sale of a Gift Certificate as a tender type with a sale of merchandise if you wish. The total to pay would be the total for the merchandise sold plus the amount of the gift certificate. To redeem a Gift Certificate as a tender type follow the instructions given above. The advantage of issuing Gift Certificates as tender type and redeeming Gift Certificates as a tender type is that neither the issuing or the redeeming will affect the subtotal or total of the invoice. Copyright � 2009 Techsoft Inc.